Our friend and Orvis-endorsed guide Josh Nugent–of Out Fly Fishing Outfitters in Calgary–was in town last week, and I grabbed him to do a podcast. Josh did one with me a few years ago entitled “The Seven Deadly Sins of Sight Fishing,” which was really popular, so we decided to do “The Seven Deadly Sins of Streamer Fishing.” If you think streamer fishing is just chucking a big piece of meat out there and stripping back, Josh has some revelations for you–revelations based on thousands of hours on the water. What do you see as the biggest revolutions in fly-fishing technology . . . and the biggest flops? Is there a difference between dry-fly and nymph dubbing? If trout are sensitive to cold temperatures, why do we catch them ice fishing? Why are fly rods always made in 6-inch increments? How do I substitute hooks when a tier on YouTube mentions a specific model? If I am fishing a tandem streamer in a place where only single hooks are allowed, which one do I cut off? Why do trout jump out of the water? Is a digital thermometer better than an analog design for fishing? What hackles should I buy for dry flies or wet flies? What YouTube channel do you recommend for reliable fly patterns? Do boots without felt really decrease the possibility of spreading invasive species? How do I get the perfect consistency with head cement? Do I need a stripping basket when using my switch rod? Why did you make H3 rods with that ugly white label? What 10-20 flies should I tie next after going through all the flies in the kit? 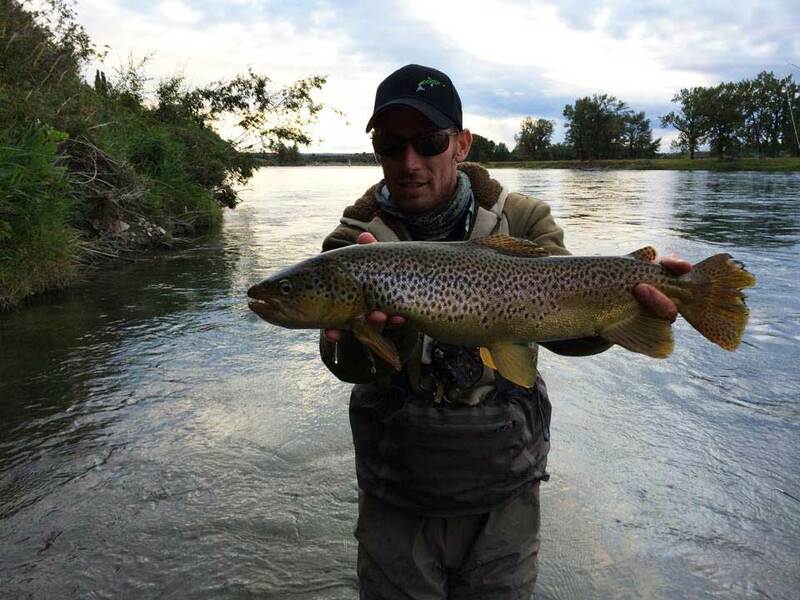 Josh Nugent with a gorgeous brown. The listener who asked for information about hook equivalents across manufacturers hit a nerve: even within the same brand, size seems to mean different things on different styles. It doesn’t help (IF I recall correctly) that size is keyed to gap(e), though for matching actual bugs, the length matters far more. Inertia means that the arbitrary sizings will continue. But adding actual dimensions of the hook in pattern recipes and also on hook packages would go a long way at low marginal cost. Several decades ago, Alan Bramley at Patridge proposed such a system: length of shank X gap, in millimeters (though he might have have suggested it replace the arbitrary sizes rather than complement them).